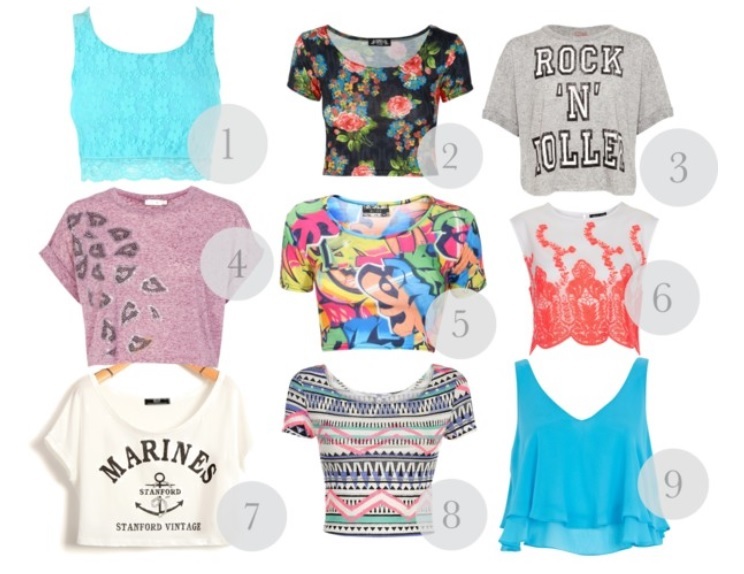 Summer was made for crop tops. Check out these super funky + purse friendly ones. one: Lets talk lace, who doesn’t love a bit of lace these days, ay? I think aqua really compliments light hair colours, so if you’re a blondie, team this crop with some white embellished shorts and you’re off! At such a great price, it’s of course fashion union. I’m falling more and more in love with this website everyday, plus they do international shipping, hooray! two: I’m a sucker for anything floral, so it’s no surprise that this baby is up there. Perfect for a summer night out on the town with a skater skirt and some big chunky wedges, throw on a bit of gold bling and you’re ready! three: I must admit i’m rather enjoying the whole ” random slogan on a t’shirt” phase. The roll up sleeves on this top are cute and you’ll keep nice and cool in the day with this one as it’s a baggier style. Rock this with some studded denim shorts and you’ll be the coolest rock ‘n’ roller on the scene! four: I’ve always loved anything with a bit of animal print on it and who doesn’t like purple? This item is currently on sale over at river island for just a tenner! Quick! five: okay the main reason I love this top is because it reminds me of mc hammer. Isn’t it awesome? You’ll be sure to stand out with this graffiti look piece! six: I love the oriental look this top has and i’m really loving the bright orange! You can grab this off the topshop website in the sale now, whilst you’re there, pick yourself up a pair of high waisted white shorts. They go perfectly with this top and will become a summer essential trust me! seven: Another baggy style, best for the summer time! Like I said the other day, I love big random prints on tee’s! eight: The Aztec print is everywhere right now and i’m lovin’ it! In fact I bought a monochrome Aztec print skirt in peacocks the other day(outfit post coming soon). Aztec print is another great one like floral, because you can team it with pretty much anything, another essential! nine: This last top is a double layered v neck(front and back). The colour is beautiful and I adore the shape/style. Another Friday night peace, perfect to team with a black, high waisted skirt or pair of shorts! River island never let me down!